Born in Durres, Albania, Elvira Dones is a novelist, screenwriter and documentary film-maker currently dividing her time between the US, Switzerland and Albania. 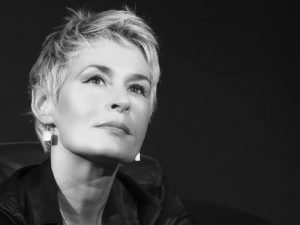 After seven novels in Albanian, she wrote the two most recent in Italian, her adopted language: Vergine giurata (Sworn Virgin) and Piccola guerra perfetta (Small Perfect War, 2010) about the Kosovo war. In her prize-winning documentary on the phenomenon of ‘sworn virgins’ in Albania, Dones interviews six survivors of the practice, one of whom emigrated to the US like Hana in the novel. 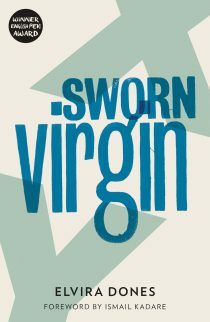 A film adaptation of the novel Sworn Virgin was released in 2015. Read more about the ‘subtle and provocative’ Sworn Virgin. Read Elvira Dones’s facebook page here. Read Elvira Dones’ piece on sworn virgins and her novel in PEN Atlas, Helen Brown’s feature-interview with her for Sunday Telegraph and National Post (Canada), Female First’s interview with Elvira on Sworn Virgin, and her interview with BBC World Service. 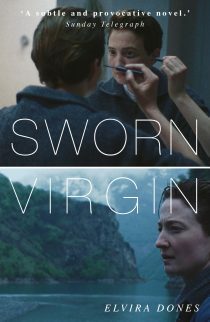 Sworn Virgin is now a prize winning film directed by Italian director Laura Bispuri and starring Alba Rohrwacher! Ahead of a general release, it has won top prizes at film festivals, including the Nora Ephron Prize at the 2015 Tribeca Film Festival and the Firebird Award at the Hong Kong International Film Festival. ‘This book by Elvira Dones grabs the attention with its subject matter even before you turn the first page . . . As well as this unusual coming-of-age story, with its shadow of death and grief, Dones gives us a compelling portrait of life under communist rule, where “anyone who owns a pair of jeans in Tirana is rich and powerful” . . . a fascinating story’.